Everybody wants to play where the pros play. Visiting Fairmont Mayakoba, located 40 miles south of Cancun along the Riviera Maya gives you just that chance. The resort’s El Camaleon Golf Course, ably designed by Greg Norman, has been a PGA Tour venue since 2007. The layout takes you through a forest, mangroves and the beach. Few, if any other, courses can boast of an opening hole that has a subterranean cavern (known as a cenote) right in the middle of the fairway El Camaleon. 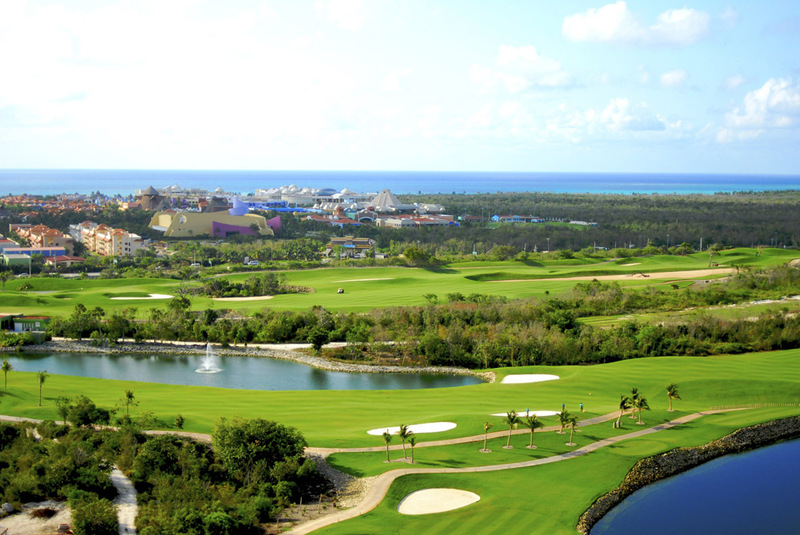 The colorful Caribbean serves as the backdrop on two par 3s, while some degree of wind is always present. Many of the resort’s 401 rooms and suites come with spa-style bathrooms and furnished balconies or terraces, while a Willow Stream Spa includes a couple’s suite located in the treetops. The resort’s four restaurants were renovated in 2015 and menus were upgraded thanks to a partnership with celebrity chef Richard Sandoval. *The OHL Classic at Mayakoba is Mexico’s only PGA TOUR event and takes place every year in November. The P.B. Dye-designed IBEROSTAR Playa Paraíso Golf Club is located 30 minutes from Cancun International Airport in Playa Paraíso, between Cancun and Playa del Carmen, on the Riviera Maya. Opened in 2005, the layout is highlighted by the par-4 9th hole, where your tee shot must carry a 180-yard-long rock river bed to reach a severely uphill-sloped fairway. A replica of the famed Chichen Itza pyramid (which contains the IBEROSTAR Maya lobby bar) is a hard-to-miss aiming point for your second shot.